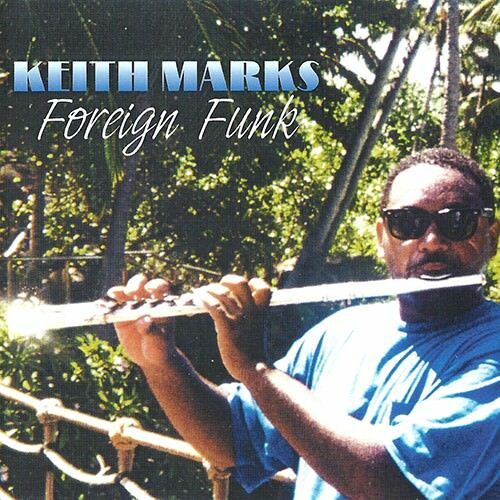 A couple of things are notable about jazz flutist Keith Marks' debut album as a leader. First of all, unlike many jazz players, he actually knows what "funk" means -- Foreign Funk is sharply (some might say slickly) produced, and benefits nicely from the rock-solid thwock of drummer Wally "Gator" Watson and the highly tasteful electric bass playing of Donald Nicks, whose style comes very much from the funk and soul world more than from straight-ahead jazz. Keyboardist Pete Levin lays fairly low, adding color where needed but otherwise generally leaving plenty of room for the soloist and the rhythm section; guitarist Lou Volpe brings a variety of tones and styles to the session, some of them quite sharp and bluesy. And this brings us to the second noteworthy aspect of this album, which is Marks' flute playing. Most jazz flutists come to the instrument by way of the saxophone, and their tone (breathy, swinging) shows it. Marks came to jazz by way of classical music, and his tone (round, cultivated) shows it just as clearly. His compositional style sometimes shows it as well; the simple arpeggios that comprise the head to "Patsy," the equally simple blues outline from which the title track is built -- these might be rooted in the classical musician's condescension toward jazz or may simply reflect a compositional skill that is less developed than his technical chops. Either way, on this album Marks shines best on his renditions of others' tunes, even when his tune choices are a bit puzzling: fine arrangements of Joe Zawinul's "Mercy, Mercy, Mercy" and Harold Faltermeyer's "Axel F" share space with wedding-band standards like "Summer Breeze" and "Always," tracks that are only saved from easy listening bathos by the rhythm section's indestructible funk solidity. On the other hand, he makes a strong case for "Eleanor Rigby" as a soul-jazz vehicle, and even manages to wring some musical interest from yet another recording of the Mission Impossible theme. Not essential, but not bad at all.